Christopher Columbus arrived in Puerto Rico during his second voyage on November 19, 1493 and named the island San Juan Bautista, in honor of the Catholic saint, John the Baptist. In 1508, Juan Ponce de Leon founded the first Spanish settlement and then later continued to serve as its Governor. For the explorers and the colonists of the New World who came from the east, Puerto Rico was an obligatory stopping-place in the Caribbean. Through the years Spain fought off invaders to Puerto Rico, long considered a strategic entry point to the Caribbean region, and finally ceded ownership to the US at the end of the 19th century. The Spanish colonization, the forts and castles built to protect it, the European influence, the natural beauty of the mountains covered in rainforests, the natural location bounded by the Atlantic Ocean on the north and the Caribbean Sea in the south and the protection and facilities offered by the US all make Puerto Rico one of the most interesting places to visit. Day 1: We landed in Luis Munoz Marin airport, the international airport in San Juan. Luis Muñoz was the first popularly elected governor of Puerto Rico. We rented a car and drove to the Wyndham Rio Mar Resort and Spa, 45 minutes to the east in the Rio Grande area. The hotel offered everything we needed; 20 minutes from the ferry port in Fajardo, 10 minutes from the El Yunque National Forest, an entrance right on to the beach, daily iguana feedings and a pool just for babies and toddlers. Perfect! We unpacked and spent the evening strolling on the beach followed by dinner at Shimas, the resort Asian and Latin fusion restaurant. Day 2: El Yunque National Forest was only 10 minutes from the resort. The road exiting from the hotel turns into PR 191 and leads in to the heart of the forest. The forest is the only rainforest in the US park system. The forest is filled with waterfalls and streams and offers people of all ages, plenty of ways to explore. Driving through the forest by car is the easiest, making all the recommended stops while combining it with hikes further into the forest only enhances the experience. Pack swimming clothes as there is water everywhere. 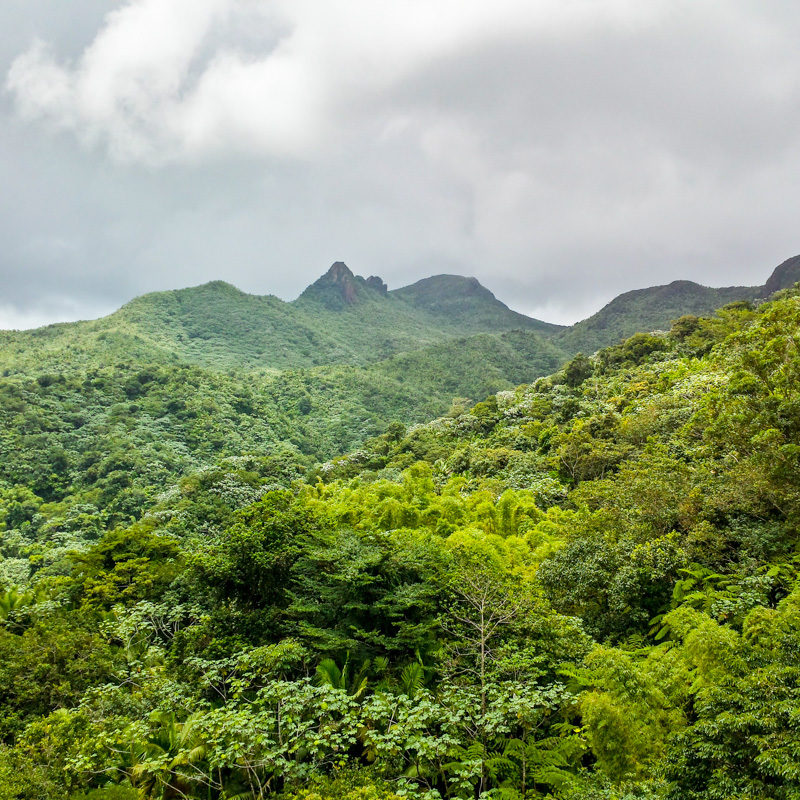 Being a rainforest, it is only natural that it would rain, but rain is usually just passing clouds and didn’t bother us enough to make us drive away. Plan for an entire day, as the hikes are lush and challenging and once you get your feet wet in the streams, the waterfalls are just a dip away. Once in, it isn’t easy to come out. We returned after sunset but still found enough time to go for a late evening swim. Dinner was at the hotel lobby bar. Day 3: Following the instructions of the hotel concierge, we packed breakfast and left early for the ferry station in Fajardo. However, the definition of early is relative, and arriving an hour before the ferry wasn’t enough to secure us seats. The morning ferry to Culebra was all sold out. Disappointed, we returned but true to the adage of the silver lining, a day spent on the beach and pool, sipping Puerto Rican rum was exactly what we needed to unplug from everything, including our phones and Facebook. Day 4: Determined to find our way to Playa Flamenco, in Culebra, we reached the ferry station even earlier. This time, we made it, and after an hour journey on the ocean, we reached the island of Culebra. Since we had no intention of staying the night, we took a $5 ride to Flamenco beach instead of the preferred jeep rental. Playa Flamenco is paradise. White sand, blue waters, green hills, more sea gulls than people, more fish than sea gulls, and corals to hide them, this has to be one of the best beaches in the world. All this solitude comes with a complete lack of modern facilities, so pack towels, umbrella, chairs and food. The water and beach might be inviting, but the hot sun will quickly have you searching for shade. Pack sunscreen, more sunscreen and still more sunscreen. After a day of water fun, and an energy-sapped ferry ride, we drove 60 km to the west to check in to our hotel, La Terraza, in Old San Juan. Old San Juan is a walker’s paradise. Every callejon (street) is dotted with colors that will pop and at each corner of the small island is a fort, a castle. As you explore, churches rise to the sky, the ocean laps against its walls and its cats roam freely. This is truly a Caribbean paradise. Old San Juan is located on a small and narrow island which lies in the north coast, about 35 miles (56 km) from the east end of Puerto Rico, and is united to the mainland of Puerto Rico by the three bridges. It is bounded by the Atlantic Ocean to the north and to the south by San Juan Bay or “Bahia de San Juan” which lies between the city and the mainland. We walked 200m to St. Germaine, to bite into the most delicious sandwiches and quench our hunger. Day 5: It is recommended that you walk 10,000 steps each day to stay fit and healthy. On a good day in Chicago, I average 5000 steps, walking between meetings, the morning Starbucks run, and a walk to the café a floor below. In Viejo (old) San Juan, I walked over 27,000 steps. Over 13 miles on a single day. Walking is perhaps the best way to get acquainted with the Old City. If you need a break, hop aboard the free trolleys that make the rounds to and from La Puntilla and Covadonga parking lots at one of the clearly marked stops. Great service. We started with Castillo de San Cristobal, one of the key forts that protected San Juan from the invaders and pirates and today a highlight contributing to Old San Juan being listed in UNESCO’s World Heritage Site lists. Spread over 27 acres, the fort takes a few hours to explore without counting the time being lost in the many tunnels. We planned for an hour and spent more than 2. Coming out of the fort, we walked south, found our to the Paseo de la Princess and followed the sign to Barrachina, the birthplace of the pina colada. Mofongo and black bean soup was lunch and pina coladas all around. We took Cristo street back up north, stopping at San Juan de Bautista cathedral, home to the remains of Juan Ponce de Leon and then at the San Jose Cathedral. Almost anachronistically, as we reached the San Felipe El Morro castle, a street performer wearing a Mickey Mouse costume was working for tips. All the blue waters, iguanas, and colorful doors of Puerto Rico couldn’t bring the smile Mickey Mouse brought to our 3 year old. El Morro is the North west end of Old San Juan, and is impossible to miss, whether or not the lighthouse is functional. San Felipe el Morro is a fort. At its peak, it had 400 cannons pointing over the 360 possible degrees. This fort was not going to be taken and never was. it is also a World Heritage Site. More walking, and all we had capacity for at the end of the day was comfort food pizza, but calling Perilo’s pizza just comfort food, is unfair. The pizza was yummy! Pair it with their Sangria and all the pain in your legs disappears. Day 6: Half a day in Old San Juan, and what better way to spend it but walking around. We did return to the Paseo de la Princesa. Paseo La Princesa is near Plaza de la Marina with the statue honoring the Puerto Rican immigrant. It is a promenade lined with trees, pocket parks, sculptures, and benches, and leads to a magnificent fountain (Raices fountain) with a bronze sculpture by Luis Sanguino depicting the island’s cultural roots. We followed the path outside the city walls to the San Juan Gate (Puerta), and entered the city as guests would have hundreds of years ago. La Muralla or city wall, was built to protect the city from enemy attacks. Its construction began in 1634 and its 20 foot thick masonry walls completed by 1782. From the San Juan Gate, you will be able to see Isla de Cabras and a small Spanish fort, Fortin San Juan de la Cruz, across the bay. Lean over the walls by the water, and you will sea star fishes, urchin and crabs all gently sunbathing by the shallow waters. Just above the gate, is Plazuela de la Rogativa. It features a small plaza with a bronze sculpture by Lindsay Daen. The work recreates the day, that according to legend, a bishop and his companions helped frighten away British troops during the 1797 attack on the city by carrying torches and chanting. The enemies thought the procession was local troop reinforcements. We had just enough time to unpack our pastries from Cafeteria Mallorca and enjoy our last glimpses of Puerto Rico. We took the non-stop flight back to Chicago and have already started wondering when we should return.